I found this Macbook in TMR back in September. It was missing a battery and a charger. A friend of mine had the same model, making it easy to test without investing any money. The computer worked fine, and I ordered the necessary parts on eBay for around 55$ – a great deal, since this model typically sells for around 200-225$. I’m enjoying life with a laptop. I’ve made a habit of taking it to the café on Mondays (Tuesday this time! I was too busy yesterday) and writing these posts over sandwich and a latté. It’s a nice treat for me, and I appreciate getting out of the house more often. This may sound silly to those who have had laptops for years, but this is my first one! Well, actually it’s my second (both of which have come from the trash), though my first was buggy even at its best and I never felt comfortable taking it out. This machine definitely isn’t “top of the line” anymore, but it works perfectly fine for what I use it for. Apple laptops are the best in the business, and I expect this will last me a good while. Last week began fairly well. I went on Sunday night to a spot in Cote St-Luc that had been productive the few weeks prior. (I forgot to snap a photo, however, so I had to use the one from last week). There were two large garbage bags totally full of family photo albums, most of which seemed to be from the 70s and 80s. I brought them home on the off-chance that there was something older or otherwise cool in there, but there wasn’t much. It seems like a shame, though these people might have just taken too many photos, like some people do today. I put them back on the curb to meet their fate. The most notable finds were these two stone carvings. The one on the left is made from some type of green rock and weighs a ton. It looks to me like a three person group hug, though it’s hard to tell that from the photo. The one on the right is made from soapstone. I bet these were expensive originally, but I don’t think there’s much resale value unless the green rock is somehow valuable. If anyone knows what type of stone it is, let us know in the commments! Otherwise, I saved: a nice vintage toolbox; a heat gun; a bag of tea lights; a candle-holder from Israel; a magazine holder; several small picture frames; and a lettering set. On Wednesday I decided to make a special trip to check out Pointe-Claire. It’s pretty far away, and not somewhere I want to go regularly because it takes a lot of time and gas money just to get there. However, it was nice to explore the area, and it’s always good to explore different places – it gives you a better chance at coming across a really worthwhile spot. There were four bags in front of this house, all of which clanged like kitchenwares when kicked. I saved a bunch of dishes, though none of it was particularly notable outside of a large crystal glass pitcher. The best part for me was the change sitting at the bottom of the bags. Much of it was foreign coins (mostly from Mexico) but there was another 4.24$ in Canadian currency, including one loonie. I came across this spot a little later on. Inside an open box was a collection of sewing magazines, most of which were from the 40s and 50s (but also one from the 20s). The coolest was titled “Make and mend for victory,” which was published in 1942 during WWII. Otherwise, I brought home: a cute glass dish; some patches; a wooden box with some hermetically sealed smoked salmon inside (not sure if I’m brave enough to try the salmon, but at least the box is nice); a little portable mirror, one side of which features a photo (probably from the 1950s) of a museum in Prince Rupert, B.C. ); and a cute painting of horses by someone named Irène. I also saw this cool old organ. It’s a shame this was curbed as it appeared to be in good condition, but there was no way I was getting it in the car! Going out of my way again, I went to Lachine on Thursday night. It’s a nice neighborhood with lots of potential for good garbage, but came away with only a pair of rollerblades. I was feeling really confident I’d find something, but as usual the location of good garbage is impossible to predict. It was a good reminder not to take gut feelings very seriously – I would have been better off spending that time relaxing. Still, I wanted to make another find – my blog post was looking like it was going to be pretty bare! I decided to do an “old school” run by bike and trailer to the eastern part of the Plateau on Friday evening. I used to do the route religiously, every Tuesday and Friday. However, I’ve barely done it in recent months – especially since the car era began – despite it being only a short bike ride away and the source of many a good find. It simply fell out of favor, mostly because it has a tendency to boom and bust (but mostly bust). Still, I felt like exploring the neighborhood, hoping the unpredictability of garbage would provide me something nice. I also felt like biking for a change. The run was mostly bare, as I sort of expected given that it was still the middle of the month. However, I did come across a spot that provided what I was looking for – something to talk about. There were several bags in this one area near Fabre and Mont-Royal that contained some miscellaneous junk, some of which seemed to have come from a shed. I looked in one of the bags and spotted a nice pair of virtually brand-new CCM Alpine skates. Upon pulling them out, I noticed a little surprise underneath. It was a plastic container full of change, conveniently taped up so that I wouldn’t have to pick around the bottom of the bag to collect it all. There was 14.46$ in total, including a loonie. I find change often enough that I got a TD bank account specifically to use their free change-sorting machines, but it usually only comes a few coins or dollars at a time. Oddly enough, both times I’ve found large collections of change it’s been in the Plateau, the other time being a jar with around 25$ inside that I came across nearly a year ago on a cold, January night. It was only a couple blocks away too, come to think of it. Edit: I almost forgot about another collection of change, again just a few few blocks away, that I found while walking with my mom last June! That pile totaled 13.82$. For the record, I think this is more of a strange coincidence than proof that Plateau residents throw out their change in droves. I don’t really get people throwing out their change, especially loonies. It seems even a bit offensive, particularly in the Plateau where this person could have walked half a block and given it to someone in need. Regardless, it made my trip worthwhile! I also recovered a couple of slides, which I’ll likely leave on the curb for someone else to find. -Merlin (vintage electonic game): to a roommate for 5$. I didn’t ask for anything, but he insisted on giving me 5$ for it. I always accept money when people insist more than once. He might sample its very 1980s sounds for use in music. Found in TMR (but not mentioned on the blog) two weeks ago. -Vintage sterling silver rosary: on eBay for 54$. Found in Verdun back in May. -Vintage brass ashtray (Simon Arzt cigarettes): on eBay for 30$. Found in TMR December of last year. -Shimano bike shoes: on eBay for 45$. From a spot in Rosemont that provided a bunch of great bike stuff, including a few bike locks with keys included. -Signed photo of Marlene Dietrich: on eBay for 38$. Found in April with the Nazi passport in the Golden Square Mile. -Quaker Oats “Big Inch” deed of land (promotion): on eBay for 22$. Found nearly a year ago in the Plateau. I’m glad to see this go, as I procrastinated about listing it for quite some time before doing so this week. -Small change: processed in the TD bank change machine for 31.90$. Includes the totals found this week. Total: 225.90$, 5789.65$ since May 18th. A pretty good week! eBay sales seem to be picking up a bit as the holidays near. I felt inspired to get some jewelry up on Etsy this week, after largely neglecting the store for quite some time. I started to remember how much money I used to make off it, and also don’t find some things (like guessing the shipping costs) as stressful as I used to. Check out the link to my Etsy store below if you’re curious – the top 12 items are all new. Note: I offer local buyers a (often significant) discount on all eBay and Etsy prices. Email me for more details. I am not Canadian. What is a loonie? If you ever find photos like that in future, please let me know. I’d take the time to digitize and make them available online. Such a shame to lose them forever. How can people throw out family photos like that in the garbage?We moved from Texas to Chicago to Tallahassee to Toronto, where we now have lived for 10 years.We carried with us three boxes of photos each time—no problem,we have photos dating back four générations.We keep them all and digitized many.It is easy to transport them.You should have taken them and digitized them.Please do so in the future. I simply don’t have time to do these kinds of things. I have a full schedule as is. If someone were to start some kind of non-profit organization that performs this task, I’d be happy to donate this kind of stuff to them. However, I don’t have the time, and more importantly don’t have the space to do this kind of stuff. I’ve seen people dump photos too often to feel too bad about it at this point. Long live your new (to you) Macbook! I wish I could gett a better look at the green rock carving. It looks Inuit, as well. If the rock is heavy, it could be green granite. Are these two carvings signed? Some soapstone trinkets are virtually worthless … just tourist knock-offs. But some are worth some money. I’m sure those old sewing magazines are quite saleable. Loose change. It’s all money! I noticed a few items had disappeared from your ebay listings. Good stuff! I hope you have a very profitable holiday season. I’ll keep her in mind going forward. I don’t recall being offered storage, outside of a place to do yard sales (but not store things). If I had a convenient storage area, things would be different. I have a very similar sculpture (the greenish group-hug one) that I got in a yard sale for 1$. I was pretty sure I’d made a great deal because it looked like a lot of Inuit sculptures I’d seen in the past. 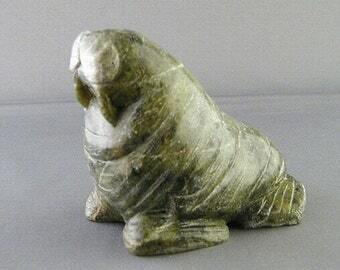 I had no clue what type of rock it was made of (or ever wondered until I read your post), but by googling “green rock inuit sculpture” I landed on something that looks pretty much like what I have (and what you have, though yours seems to have more “streaking” going on with it). It appears to be a type of soapstone (which comes in many shades): http://dominionantiques.com/novem11%20(66).JPG or https://img0.etsystatic.com/032/0/6687447/il_340x270.566656470_7h88.jpg. My sculpture weighs a ton too. Thanks for the info. I doubt it’s worth much. It seems that they have value only if they are obviously in the shape of an animal (or inuit), and then they can go for a few hundred or more. If yours is one of those, get it on ebay! Did anyone rescue that organ?It upsets me when working musical instruments are junked. Organs are the sort of thing that are heavy, and not so wanted anymore. That thing is more like furniture, but it’s heavy and likely is only an organ. The original expense because it took a lot of circuitry, and the furniture aspect. It’s not like someone threw out an acoustic instrument, the sound reflects the shape and construction. It was a home organ, which nobody particularly liked the sound of, unless someone is doing some music that requires that retro sound. I’ve seen them. I once saw a fairly fancy and more recent Roland keyboard on a lawn a few July 1sts ago, way too heavy to carry and I suspect few would want it. I’ve also seen bits of synthesizers. But now “electronic keyboards” do it all and more without taking up as much space, or being as heavy. They are cheaper, and provide a wider range of sounds. I’ve seen some of those int he garbage, a lot easier to carry home, but I’ve also seen them at garage sales for not that much. If one is careful, one can find a whole music studio. I found some very fancy bits of electronics that are now totally obsolete, something like a digital recorder but so old that it had limited recording space. But I’ve found effect boxes, a drum machine (that one needed the connectors cleaned) a mixer last summer. I’ve yet to find any reel to reel recorders in the garbage (not that anyone would use those nowadays) but I could have bought one at a garage sale a few years back. I pause and realize that while I would have loved to have one decades ago, now the only use is to have it as a collector’s item. Digital recording is the way to go. When I got a powerbook 1400 at a Santrapol Roulant sale about 2006, it came without a power supply. I looked up the voltage, and the connector, and opened up an inkjet printer that I’d hauled home from the sidewalk. I can’t remember if it was the first or second one that I opened up that had a suitable power supply, in its own enclosure. I can’t remember why I knew inkjet printers had higher voltage supplies that might be suitable, but it was easy enough to get it. It’s easier now. I’m finding a lot of AC adapters for various things, including laptops. I tend to grab them, because I might find something later that can use it. I may have to change connectors, but they are there waiting. Laptop batteries aren’t as easy to find, especially if one needs them to work. To respond to Michael Black’s comment on reel-to-reel tapes and recorders,I saw three or four of them earlier this year at the St.Michel flea market.They sell a lot of retro stuff and collectors’ items.I live in St.Henri and I also saw one reel-to -reel tape on top of a recycling bin in St.Henri on St.Antoine street in front of an old house.Collectors still love them. I follow your blog closely and love the historic stuff you save.I think you should give family photo albums that you find for other volunteers to scavenge.There is a blog http://retainedmoments.wordpress.com which is a collection of photographs and ephemera saved from curbside garbage.Please check it out.Thanks. give these photos a place to live. someone cared, at one time. if someone truly wanted to destroy them, they would have. kind of nice to think of them on a website, with folks enjoying them in some manner. hope you can do some of this. That’s my other blog, haha (though I haven’t updated in a while). It was great to read of Pointe Claire in your foraging trips.Check out Pierrefonds and Roxboro by going west of Cartierville on Gouin.It could be fun and productive for you. Would a store manager hire a job applicant who is known to recycle cans and beer bottles found from the garbage?Many people say no.Others say yes.What do you say?Isn’t there prejudice in Montreal against bottle collectors,can recyclers and even other scavengers too?Many people think scavengers are dirty,filthy,poor people with little education.Would a known scavenger be hired by many store managers even if he had great attributes,a work ethic,bilingualism,etc?What do you think?What do your readers think?Want to know. Really depends, though I’m sure some people might be sketched out about it. I wouldn’t put it on my resume, haha. I don’t see them knowing about it in the city, though in a smaller town you might develop a reputation and it might be a bigger issue. is probably your blog because I remember you finding pics of Hitler a couple of years ago and a few other photos.I was pointing out the obvious.However,check http://www.TheGarageSaleMillionaire.com based in the US. I am sure some very rich people scavenge in the trash too to save history or to make even more dough.I hope you will find such anecdotes and share them on your blog. I think it’s mindset rather than money. Most people won’t look. Even people without money, which is to their detriment. But some do. There are lots of reasons, not everyone does it to resell things. It really is neat to find an iPod, it can be neat to see what can be found. Artists may look for the “right” thing, they don’t know what they are looking for until they find it. Someone may just hate to see still good things thrown out. Others may think ” why buy something when it’s right there for free”? It might be the challenge. I’ve found amazing things, made even more amazing because they mean something to me, while others wouldn’t find it one bit interesting. It’s like magic, to come along at the right moment to find something that is valuable only to me. It’s seeing the world differently. People with little money can be wasteful, people with money can be frugal. You probably can’t get rich from saving garbage and being frugal, but you can have money and waste it because you think frugality is only about saving money. Martin I thought you might find my recent experiences amusing. I bought an inexpensive Roadmaster bike from Walmart. I was close to my home when I found something too heavy to use the bike, but was light enough for me to carry home, so I parked my bike on the lawn near the garbage, after dropping it off at my house, then while walking down the street, I could see head lights stopped next to the garbage where I parked my bike. Earlier I saw a truck loaded with scrap riding around and I got there before my $80 bike became a victim and turned into a $2 piece of scrap. A week later,I saw a Samsung LCD TV in the garbage, so I was able to carry it, while riding my bike. When I got home I planned on quickly dropping it off before going out again, so I just parked my bike in front of my house. As I was bring it down my cellar, I was curious if it worked, so I quickly tested it. I was walking to my bike and noticed it was gone and tail lights from a truck moving down my road, so I started running, but it was moving just out of my reach. I raced to my house to find my car keys to hunt down the truck. My car started slowly being so cold and I raced to where I last saw the trucks tail lights headed. I reached the end of the road and looking on the side streets while driving, there were no lights and no sign of him, being that there are a maze of streets, I thought for sure I lost him and my new bike. I turn around and from a distance saw lights coming toward me, as he got closer I could tell it was the same truck, so I pulled in front of him, then got out and asked him “if he had picked up a bike”, before seeing my bike in the back with other scrap metal. At first he thought I just wanted the bike, but after I said that it was left before I went into the my house, he was very sorry for taking it. I told him I won’t leave my bike out in front anymore and is a lesson to be more careful when parking my bike, even if it’s a quick pit stop. Lol, a good story… good thing you found him in time? Did the LCD TV work? The TV had no picture when I plugged it in and made an intermittent clicking sound, with the red power light flashing on/off. I searched Google and there is a recall for bad capacitors in that type of TV, which will cause the same symptoms. I have seen videos on Youtube on how to tell which capacitors are bad and even how to replace them yourself. I will see if it’s an easy fix and if not, I might sell it for parts or just scrap it myself. I think the recycling Gods wanted me to reply to your blog, because I just found $25 Canadian ( after the exchange rate + fee = $18.50 US ) and another time I found a Polar bear coin, which was cool looking. It was funny, the last time I went out one spot had 3 small bottles of unopened wine, with about 10 bottles of beer and another had 20 bottles of beer, with a 6 pack of Coca-cola. That same night I found a case of peanut butter filled cheese crackers, that were expired, but were still good and would of cost me at least $28 if I bought them. P.S. I’m sorry about the terrorist attack in your country and I hope working together we will stop future attacks and defeat them too. 25$ in bills? That’s a sweet find. I don’t think we throw out American bills that often here (because we know it’s worth more, ha ha. I think I’ve found 1$ bills on a couple of occasions). I’ve found Canadian bills a few times, though, mostly (I assume) due to people not knowing it was there in the first place. Keep an eye on that spot! The best may be yet to come. Yes, it was a $20 bill with a $5 bill + some US change and to make it more unusual, there were a pair of 14k gold heart ear rings, with one missing it’s clip holder. Along with the money was a $20 gift certificate to a place called Inatural, but it was from 2001 so i don’t know if they will honor it ( maybe I will get to have my nails done before the holiday….lol). Yeah, I went back a few days ago and they hadn’t put out there trash yet, but that advice works. You are welcome and if I don’t reply again, enjoy your Thanksgiving. Believe it or not after thanksgiving last year I found a frozen 15 pound turkey, so I ate well and made a delicious turkey soup. Canadian Thanksgiving is actually a different day (almost a month ago now, haha) but thanks. Superb story from Mark.That is why I do not pick anything up from the sidewalk unless I see it in the garbage on TRASH PICKUP DAY OR THE NIGHT BEFORE.If I see a box with FREE’ on it,I might take it.But otherwise no.One can be accused of theft and can ruin someone else.Very valuable story,Mark.Thanks for saharing it. If your looking for laptop, cellphone chargers go to the hotels in your area. They usually have tons of those things that were left in their rooms by there customers. You write sometimes that most of the scavengers you come across are bottle and can collectors or scrap metal collectors.But I see quite a few people scavenging.In Westmount,near Westmount Park,I saw a middle-aged woman pulling out magazines from a recycling bin while walking her dog and walking away with half a dozen of them in her hand.Another woman followed her lead and two minutes later took out three or four more home decoration magazines from the same recycling bin and then walked off with those magazines tucked inside a plastic bag.I also have seen nonbottle and noncan collectors open black garbage bags and take out tools and lamps and walk away with them.But I agree,these are not full-time scavengers very likely,only occasional scavengers.I would love to read reports on other scavengers. A lot more people are likely to take something specific than deliberately go searching. A small bookstore closed a couple of years ago, discards out on June 30th. I grabbed an LCD monitor and some other office things, then started looking over the books. Soon other people were looking too. When I came back 90 minutes later, some others were looking through the books. But those were book people. Same with magazines, someone interested is likely to grab if they are easy to take. Back when there were big green bells for recycling, I stopped someone about to put some computer magazines into the bell. Or, if someone needs a table or whatever, they may grab one if they see one nearby, without ever going to deliberately look through garbage. And that’s a good thing, if more people brought things home on an informal basis, there’d be less going to landfill. It doesn’t have to be just about people doing it deliberately. Oddly, sometimes a pile of good garbage attracts more than a few people, and that seems to attract others (if it’s a busy street), as if the others looking give permission to others. Someone opening garbage bags is undoubtedly making it a routine. Either that or there was something out in the open that interested them, so they looked further in case there was more of the same. You should do a special feature with garbage-picking outside high-rise apartment buildings and high-rise condo towers.Most high-rise apartment buildings are in Ville Marie borough,i.e. downtown and in Ville St Laurent.Cote St.Luc and Cote Des Neiges also have some high-rise buildings.In high-rise buildings,garbage and recycling is put out in big plastic bins and a lot of garbage is dropped into garbage chutes.You could find a lot of treasures here.Please do this periodically. Great score with the “make do and mend” WWII book! Lots of interest in that these days. Anyone who throws out so many family photo albums shocks me.Someone in my family threw out most of the family photos after their marriage split up.She regretted it bitterly five years later;all she was able to do was to make copies of some of the surviving ones that had been saved by other family members.But the rest are gone forever and twenty years later ,i.e.today she still wants to retrieve those thrown-out photos.Martin,family photos are not meant to be thrown out and should be salvaged. Hi,Martin,I live outside Quebec currently but spend six months every year in Ville St.Laurent every year.I am delighted by the treasures you find in Ville St.Laurent.Please continue hunting Ville St.Laurent on heavy garbage pick-up day.Please do not forget to check out the wealthy Bois Franc sector of Ville St.Laurent.Also check the wealthy streets of new Ville St.Laurent like Toupin.Murphy.Metiver,Macarthy,etc. Do you find yourself feeling lonely as a scavenger?After all,scavenging is considered as work for people on the sidelines.No career counselor even mentions scavenging as a career option—I think scavenging is wonderful.Even though The Montreal Gazette did write a long article about you and your great environmental work,there has been no followup article about you.You also deserve to be portrayed and interviewed on radio and television like CTV news,CBC news,CJAD,etc.I hope you do not get the blues while scavenging in winter. I get lonely at night sometimes because it’s so quiet, otherwise I don’t notice so much. I do work by myself a lot, though, so I have to make sure to hang out with people in my off-time. That’s another reason why going to the cafe is nice. I am tired of Kindle.I have used it a lot for three years.I am buying paper books from Indigo and used bookstores by the dozens because I want to expand my real library.I have realized that paper is far more enjoyable to me than Kindle.Of course,I will still use my Kindle for some reading–but less than 30% of my overall reading.If you find books in recycling bins and the trash,please rescue them.